The last time I was in Sydney was post-JC, way back in December 1996: a gawky kid, 14 kg lighter. It was my first taste of independent travel - sure, I'd been overseas without my parents before, but even then others had helped set the itinerary. Sydney 1996 was the first time I ever planned a trip, decided where to go. 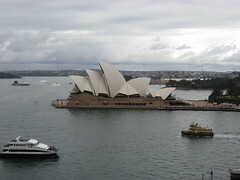 So it was with pleasure that I re-walked the streets of the Rocks today, and re-visited the Museum of Contemporary Art. (Last time I was at the MCA, a brilliant Keith Haring show was going on. This time around, I was pleasantly surprised by the fact that there was an exhibit of Matthew Ngui, the Singaporean/Australian artist whose work I've seen at the National Museum and at Potong Pasir MRT. Very inspiring.) And this time round I got to going onto the Harbour Bridge, from which vantage point this shot - captured by my new Canon IXUS 950 IS - was taken.